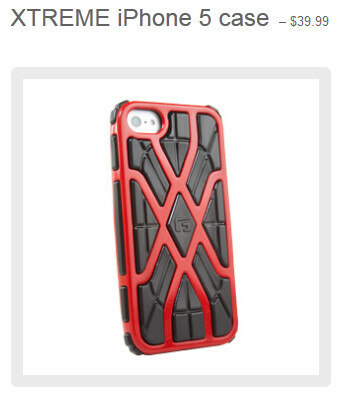 We could tell you about what G-Form's impact absorbing Xtreme Apple iPhone 5 case is all about. Sure, we could mention the Reactive Protection Technology or the fact that the case has a 3-layer protective composite with a polycarbonate outer shell, an RPT core and a shock absorbing third layer. But what does that all mean to you? Better that you take a look at a video of a stunt that was performed near Area 51 in the Nevada desert. The case used is designed for the Apple iPhone 5, but also fits the fifth-generation Apple iPod which was used for the test. The device encountered temperatures as low as 60 degrees F below zero as it was attached to a weather balloon that reached a peak height of 100,000 feet. The balloon then started plummeting to earth and was found 41 miles from the launch site without a scratch, in perfect working condition. It wasn't the first time that G-Form sent the Apple iPod 100,000 feet up to test its case as a similar stunt was tried almost exactly one year ago. Last February, an Apple iPhone 4 placed in a G-Form case was used as a puck and traveled as fast as 82mph. It survived. While the Apple iPod that was sent into space survived, the video camera aboard conked out at 60,000 feet due to the cold weather. The same thing happened to the back-up sports action camera aboard that failed halfway through the fall to earth, again, due to the cold. G-Form will be displaying it's latest Xtreme cases at CES 2013 and will be shipping this month for the Apple iPhone 5, 5th-generation Apple iPod, Apple iPad, Apple iPad mini and the Samsung Galaxy S III. Pricing starts at $39.99. To order, you can visit the sourcelink. Yeah right....even at 30.000 feet high there is -40, -50 Celsius. The phone would not work under -20 Celsius....so the camera would not work too. But what about the shock? Case that slim can never absorb huge shock damage. Internals would stop working even from a shock it gets by dropping it from, say 12 feet. it was in the dessert kind of land. Even without casing i think iPhone will not be destroyed because of the soft surface. hmm.. that's possible. Not for sure on concrete though.. Sorry guys, it's not a parachute, but rather a popped weather balloon. But it's just not a accurate test. I can't stop laughing of that icrap promotion. Now people likes to do lie because of apple. Bad bad bad!!!! It's more reliable if the throw that iPhone on the ground. That's roughly around 30.5Km for those who live in the civilized world with proper units.. degrees F, miles, feet? Are you still living in the 18th century? Sounds too fishy. Can't accept the fact a mobile can survive a drop test of 10000 ft without a scratch...good video though, next time try harder. Good thing the government did not shoot it down because it's near to Area 51. So what they did, once it landed and they saw the phone in pieces they switched it. 100,000ft?! Wow! That's, er, oh yeah... terminal velocity. As long as it hits terminal velocity it doesn't really matter what height they drop it from. Agree... They should just drop it out of the empire state building. It is enough to hit terminal velocity from there. AND will hit concrete for a better testing surface... (or maybe somebody's head). Another day, another iphone case article. Although in fairness to apple (While do I feel dirty now?) other than the daily lawsuit/patent BS, what else is there really to talk about with them? maybe that's why a new case is considered newsworthy? I'd rather rely on 10 ft drop test on concrete floor.